“Sealed, non-spillable”. Yeah right: @APCbySchneider batteries do leak. How to clean lead acid battery leaking residue. 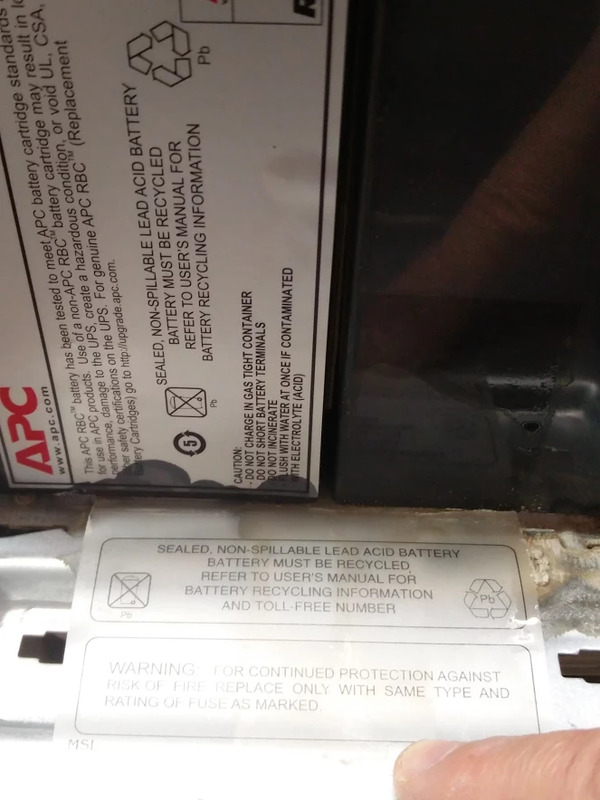 I found out the hard way that the so called APC “Sealed, non-spillable” lead acid batteries inside their UPS systems do leak when used normally. So I head to clean up before the damage would get bigger. Geeks On Cars: How to Clean Up a Car Battery Leak. How to Clean Corroded Car Battery Terminals: 14 Steps. How to Clean Battery Terminals (with Pictures) – wikiHow. How to Clean Battery Leaks and Spills | eHow. Baking soda paste: 3 parts baking soda and 1 part water. Baking soda solution: 1 parts baking soda in 10 parts water. * Zuiveringszout: Natriumwaterstofcarbonaat (natriumbicarbonaat, dubbelkoolzure soda): E-nummer E 500 (ii). In The Netherlands, you can get it expensively as “bakpoeder” ingredient (baking powder) or cheaply as cleaning agent called Zuiveringszout. ** Vaseline usually is petroleum jelly with extra ingredients, be sure to get the pure white one that is acid and fragrance free. This entry was posted on 2015/12/26 at 12:00	and is filed under APC Smart-UPS, Power User, UPS. You can follow any responses to this entry through the RSS 2.0 feed. You can leave a response, or trackback from your own site.